We find the same line of thought in Thomas’ having to touch the risen Christ before he can believe (chap. 20.27). 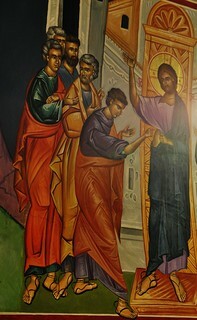 Indeed Jesus says to him afterwards: ‘Because thou hast seen me and thou hast believed; blessed are they which have not seen and yet have believed.’ In these words here at the end of the gospel reference is made, as has already been said, to those who no longer have the opportunity of seeing, and the readers of the Gospel are in this situation. These are then addressed directly two verses later and indeed specifically with reference to their faith: that ye might believe. The Thomas story, therefore, holds, as it were, the key to the Johannine understanding of the whole life of Jesus. But Thomas the apostle himself must see, he must touch. 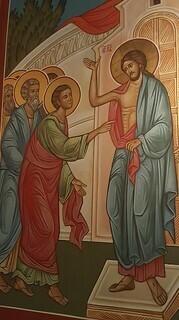 The last words of the risen Christ are not necessarily words of reprimand only, since the other apostles too, mentioned in v. 5.19 ff, had to see Jesus’ hands and side. Besides, Thomas did in fact attain to true faith, he makes the best confession of faith the fourth evangelist knows: ‘My Lord and my God!’ (v. 28). Here too, however, seeing alone is not sufficient to enable one to come to this faith. The eyewitnesses had to see, but for them also something else had to be added to the seeing. The Thomas story, chapter 20.24ff may again be mentioned here. Although, as we have asserted, the actual seeing appears there as a necessity for the apostle living in the lifetime of Jesus, the other idea plays an equally important part, the idea that believing, which must be added to seeing, is more important than seeing. That seeing in the flesh alone is in itself of little account is also expressed in the words in chapter 9.39: ‘For judgement I am come into the world, that they which see not might see, and they which see might be made blind.’ To see is here used in its double sense.